One of about 30 American species or Wild vines with complete botanical name Vitis labrusca L.. It was described in 1753 by the Swedish naturalist Carl von Linné (1707-1778) in its new nomenclature (L. refers to him in the botanical name). He referred, however, to the already described in 1623 as "Vitis sylvestris virginiana" description of the Swiss botanist Caspar Bauhin (1560-1624). It is the longest known American wild grape. Already at the beginning of the 17th century was in the USA unsuccessfully attempted by pioneers to gain edible wine from it. It forms together with the two species Vitis mustangensis and Vitis shuttleworthii the group Labruscae. Over time there have been a number of name changes, so confusingly many ancient botanical names appear in ancient sources. These are, for example, Vitis blandii Prince, Vitis Canina Raf., Vitis catawba Hort., Vitis ferruginga Raf., Vitis labrusca var. Subeden tata Fernald, Vitis labrusca var. Typica Rule, Vitis latifolia Raf., Vitis luteola Raf., Vitis sylvestris virginiana Bauh, Vitis taurina Walter, Vitis vinifera sylvestris americana Pluk, Vitis vinifera var. Labrusca Kuntze and Vitis vulpina Marshall. Trivial synonyms include Black Fox, Concord Grape, Fox Grape, Niagara Grape, Northern Fox Grape, Northern Muscadine, Parra Brava, Parron, Skunk Grape, Swamp Grape, Vid Silvestre, Vigne Lambruche and Vigne Cotonneuse. The vine comes to everything in the eastern US until the Mississippi and from the south Canada to Georgia deep in the southeast. In first descriptions, a trunk diameter of 30 centimeters was mentioned. It prefers sunny locations on sandy or damp clay soils. It is extremely sensitive to lime, which makes it problematic for European soils. The resistance against both mildews and frost is good, but she is a bit vulnerable to that phylloxera, That is why she is not considered as a pure species document For finishes suitable for European varieties. The berries or the wine have a pronounced strawberry flavor and the Foxton (foxy note) on. Therefore it is called Fuchsrebe (Foxgrape) or Erdbeerrebe (Strawberry Vine). Even new breeds, even with a low proportion of cross, have this more or less pronounced taste. Cause is the black-red Anthocyanin derivative Malvidin-3,5-diglucoside, which occurs exclusively in Vitis labrusca. Thus, a unique identification of Vitis labrusca crossed varieties in wine is possible. This flavor, which is somewhat austere and strange to European tastes (but which is much appreciated in Japan), makes it unsuitable for commercial wine making. 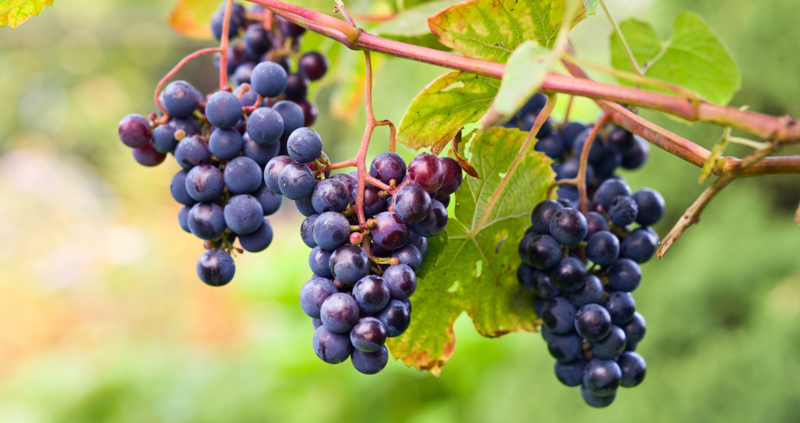 Grape varieties with Vitis labrusca genes are therefore mainly used in the USA mainly for the production of table grapes. sparkling wine. sweet wine. grape juice and jam used. This page was last modified at 4 August 2018 at 09:57.